Wonder how genuine is the support of some. Forty-six years ago today, an NYPD cop named Phillip Cardillo was gunned down inside a Nation of Islam mosque in Harlem. No one ever served a day in jail for the crime. And for 46 years, the NYPD has been withholding evidence in his murder case from the public. 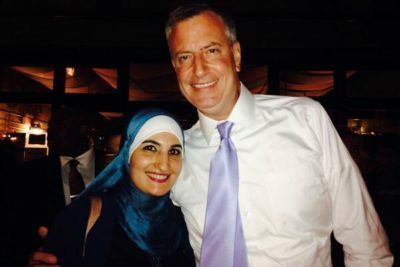 In the wake of the NYC jihad terror attack, Mayor de Blasio is wielding his sharia club, engaging in proselytizing for Islam. What is really horrifying is that Red Bill is up for re-election and appears to be a shoo-in. The Democrat machine has a chokehold on this city that goes back to Boss Tweed and Tammany Hall. Mayor Giuliani was an aberration — a blip made possible by Mayor Dinkins, who very nearly singlehandedly destroyed this thriving metropolis. It’s one thing to side with the enemy, it’s quite another when you employ the full force of government to silence your enemies. It is quite a feat for a Democrat politician running for City Council to further debase and defile the New York Democrat party and the NYC City Council. The NY City Council is a rogues gallery of racists, demagogues, and antisemites. The Atlantic is shilling for enemies of America, all of them, every stripe, every ideology. Last century’s, this century’s. This is the new left and this is the old left. The Atlantic even defends Grover Norquist, the Muslim Brotherhood’s chief operative in the Republican party. We held a press conference yesterday that was widely announced to expose the subversive, seditious and Communist candidate for New York mayor, arguably a job that is second in importance only to that of President of the United States. We exposed the Marxist and terrorist ties of Warren Wilhelm, aka Bill de Blasio.